Bicycling in China is for most people as unimaginable as traveling with children in this "hostile" country. After all, "China is a country full of people who speak only Chinese, are only interested in ripping you off and making your life in the country as hard as possible". True? Of course NOT! It used to be a hard country to travel, in Yangshuo there's still the reminder with the Hard Seat Cafe. But nowadays China is an excellent country for everyone, it's quite easy to go around and it offers everything for everyone. Cycling in China requires only one extra thing compared to other countries where I traveled: time. "China is not a country, it's a continent" I sometimes say. Perhaps in size it's a continent, but in many other ways it's certainly a country. Take for example a flight from Beijing to Urmuqi in the far west near the borders of Tajikistan and Pakistan, it takes over 3 hours flying! Or the journey by train from Beijing to Guangzhou, 2000km. Although China is big, it has a coherent structure. This is because of the Han Chinese overlay of the country. The consequence is that even big cities in areas where the Han are a minority, take Kashgar for example, look much like the newer parts of Xian, Chengdu or Kunming. Skip those cities? No way. If you come in Xian, you would not want to miss the drum tower, or the old Muslim Quarter with it's magnificent Mosque. You wouldn't want to miss the beauty of Beijing or Shanghai. But the adventure on bicycle in China lies on the countryside. You wouldn't want to miss the Kashgar Sunday market or Chengdu's parks and Du Fu village. I would like to take you on a journey that few people ever do: a bike ride from Xian to Chengdu. Xian is a great city to spend some time. Not alone you will find here the world famous Terracotta Warriors but there's much more to find in the area and inside the city walls (think only about the magnificent old Muslim quarter). The day started to find my way out of the city, which is sometimes more difficult to get into Chinese cities. Road signs are seldom clear but in this case it was easy. Soon I had left the city behind and I was back in the countryside. It was harvest season for aubergines and grapes. It seemed in this area everybody was growing them. Grapes were so sweet and in this season very cheap. Trucks filled with aubergines kept passing me. This area must be the heart of aubergine cultivation in China. I was on the road to Lanzhou, but I wouldn't go that far. Soon I was able to leave the main road and follow a road deep in the Qing Ling mountains to Foping. In one of the towns I had stayed I was warned for floods that had apparently destroyed the road but I saw no signs. This road went straight into the mountains, slowly swindling up to an altitude of over 1700 meters. I had not seen any signs of bad roads, as I had been warned for but now the road was really bad. Foping was not far but cycling on this road which was under construction was not fun. It went slow, it went that slow that I arrived in Foping after dark, something I prefer not to let happen. The next day I saw what had happened, the town had been a meter under water, not a week earlier. No wonder I was warned I might not find a hotel and that the roads were bad. But cycling out of town was easier. The road was brand new and a pleasure to do. Soon I arrive in Chenggu, at first sight a small town but it wasn't as small as I thought. There wasn't much reason to stay longer here. I was now at the northern border of Sichuan province and the roads from here all went down until I would arrive at the flatlands. I followed the quiet main road to Ningqiang and Guangyuan, Jiange, Zitong anf Guanghang to Chengdu. It would have mostly been a forgettable journey, maybe with the exception of the journey to Foping, if not something happened in that journey that stunned me. I was on the way to a city called: Guangyuan. Just before entering the city I found myself stunned gazing at the rock walls on the east side of the road. 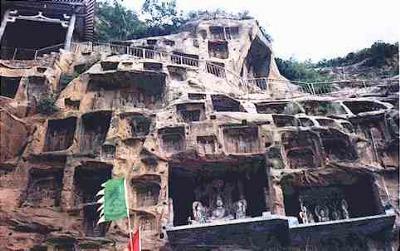 Without any previous knowledge I had found a buddhist temple rock formation similar like the one in Luoyang. It might be this one was not as big or beautiful as Luoyang and therefore was not mentioned in any of the books I read before but it nevertheless stunning. There was not even an entrance fee. Locals later told me the caves are regularly visited by pilgrims but foreigners are seldom seen here. North Sichuan is considered not to be interesting for tourist so no one bothered telling. Later I discovered the caves were quite well described in other literature but the travel literature had skipped it, for some reasons unknown to me. Another funny thing in this journey to mention is that I was almost going too deep into the northeast Micang Shan mountain range, which covers a large part of north Sichuan. It happened when I arrived at the town center of Baolu. There was a road sign to follow for Chengdu. Unfortunately I missed the next direction so I was on the way, following the river south east to Hutiao. It would not have been a problem to follow this road if it had been a good road. However, after about 10 km the road became a dirtroad so I checked my compass which showed I was going south east instead of south west. That together with the maps (I always use a Chinese map in combination with a Nelles map because the Chinese maps are usually much better) convinced me I was on the wrong road. Back in Baolu I found quickly the main road back. In fact, had the road been good enough to cycle, I would have continued. I might have missed Chengdu that way, and therefore many other adventures, but I certainly would have had many experiences too. Maybe a next time when I am in Sichuan. This area is virtually unspoiled by tourism but I am sure there's plenty to see anyway, whatever guidebooks tell me. Moral of the story, don't let the guidebooks show you the only way to travel. Have the courage to skip the tourist areas and visit the off the beaten paths areas. You never know what you will find but expect the unexpected, whatever that might be. China is big, and most of China is seldom visited by tourists. Join in and write your own page! It's easy to do. How? Simply click here to return to Your China Adventures.